Toshiba TX00,TX03,TX04 as well as a wide range of on and off chip SPI and flash memories. These greatly simplify the task of programming and debugging embedded target systems. They allow a PC to communicate with a target processor through a high-speed USB interface at the PC and a debug port at the micro. The PC can then control the microprocessor via the debug port of the target ARM chip. For Synchronous architectures such as the Cortex, Qorivva, Coldfire V2-V4, 683xx, HC16, Power Architecture PX Series and the DSC the communications can run at 4 to 10 times faster than the USB Multilink Universal or the older parallel Multilink interfaces. Unit programs A set of C library calls that provide an API for using the BDM interface. Ideal for those who need to write their own PC based test or diagnostics programs. The standard version includes a license for 5 units. The distribution version provides unlimited production of applications. An interactive flash programming software package that allows you to program/reprogram both internal and external flash devices in-circuit, via a PEmicro interface cable. 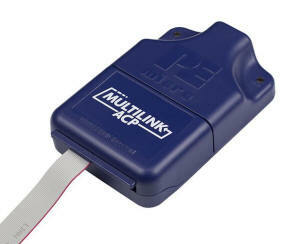 Perfect for development, production line programming, or field firmware upgrades. PEmicros products contains our entire library of setup files for this processor, and includes both interactive and command-line versions for use in development and production. † ARM Cortex M4 currently supports the following families: ATMEL SAMxxx, STM32, NXP M0,M3,M4, NXP/Freescale Kinetis (all), S32, TI-Stellaris LM3S,LM4,TM4C12xx, Infineon XMC4xxx, Maxim 716xx, Silicon Labs EFM32,SiM3, Cypress PSoC®4, Toshiba TX00,TX03,TX04 as well as a wide range of on and off chip SPI and flash memories. 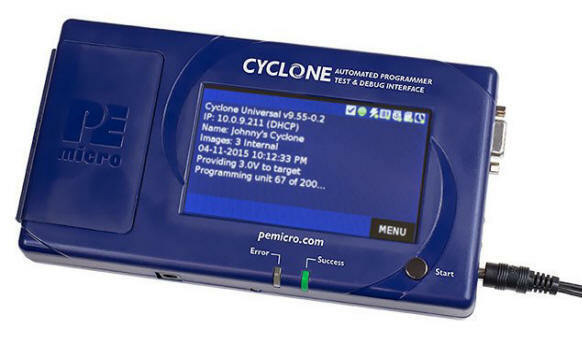 PEmicro's latest product is a version of their Cyclone box that covers the widest range of target CPUs so far. 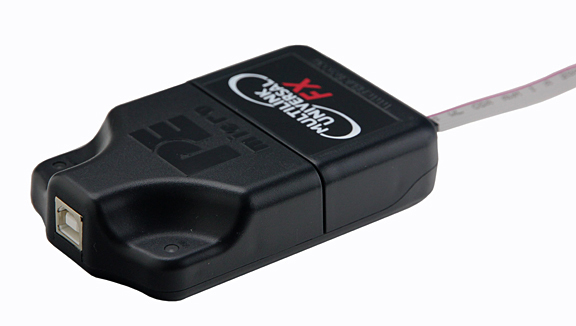 It can be used for Debugging via its fast USB or Ethernet interface with support available in most popular software packages including GCC/GDB. The same box can then be used as a standalone unit for field programming or as a production programmer in an ATE setup (batch or DLL driven). USB 2.0 link now supports "High-speed" protocol (up to 480Mb/sec link to the PC). 1 Gbyte internal memory, no practical limit to # of images held. SDHC Port for even more space. For most recent CPUs ( e.g. 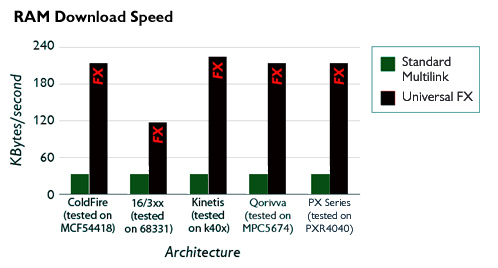 Cortex M0-4, Qorivva, HC16/683xx, Coldfire and MPC5xx/8xx ) a variant of the communication link to the target is provided that increases the download speed to a max of 25Mb/sec giving up to 5 x faster download of data. Additional security features include ensuring that if you outsource your production no one can "run off a few units" without you knowing. Interactive programming packages are provided for all supported CPU families. Or you can link it to a PC, download multiple target programs to it and then disconnect it from the PC. It then becomes a manually controlled, standalone flash programmer for on chip or off chip memory. Or it can be driven by a PC via the Ethernet, USB or Serial port with automated commands either using command line instructions or from a C program using the dll included in the package. A Software Development Kit is available that allows multiple Cyclones to be driven by a single CPU for economical operation in large production environments. Basic Edition ----- Free Download ---- Controls a single Cyclone from a PC via USB or Ethernet allowing one Programming Image to be held on the Cyclone which does not have to be downloaded every time so increasing performance. Professional Edition ----- Controls up to 3 Cyclones from a PC via USB or Ethernet, allowing up to 8 Programming Images, which do not have to be downloaded every time, to be changed on the fly and dynamic data such as serial numbers to manipulated from the PC. Supported devices can be programmed in parallel, even if they are different devices with different data. Enterprise Edition ----- As for the Pro version but unlimited numbers of Cyclones may be controlled from a single PC, More than 8 images can exist on the Cyclones and Licences for 5 end user PCs are included. Also provided is a full description of the RS232 and Ethernet command Protocols so that non Windows users can implement similar functionality.